Arguably one of the most successful people in the sports agent and business world, Super-Agent, Leigh Steinberg lived up beyond expectations when he came to speak to UCLA’s Business of Sports program this week. Leigh Steinberg on the set of Jerry Maguire with Tom Cruise and Cuba Gooding Jr.
From personal anecdotes about helping Cuba Gooding Junior prepare for his role in Jerry Maguire, a film based on Steinberg himself, to teaching the engaged students the paths of navigating an athlete away from cognitive dissonance and forward to sell them as a brand to a desired team and potential endorsement opportunities. The respected speaker extended his stay with UCLA’s aspiring students who hope to work in the sports industry one day to answer any and all questions they had throughout his lecture, and even was willing to debate some hot button topics such as sports gambling recently becoming legal as well as whether or not college athletes should be paid. Endless questions and even more interesting answers and personal anecdotes came from Day 2 featuring Wasserman VP of Athlete Marketing, Ted Yeschin. 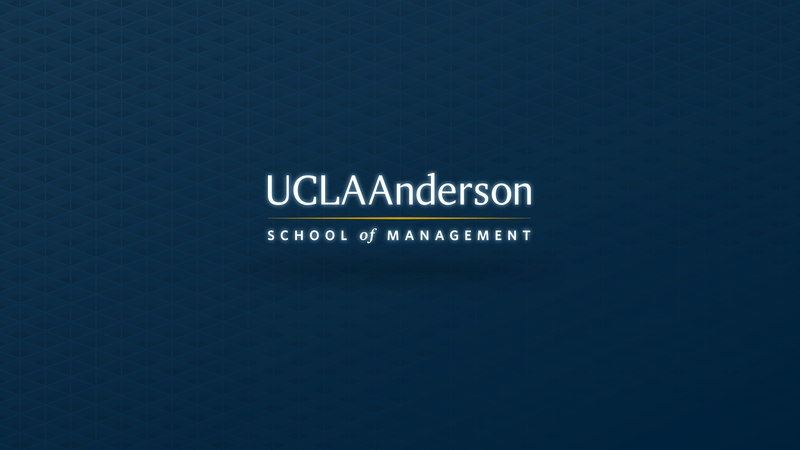 Ted Yeschin set the bar high for the ongoing series of distinguished guest speakers coming from all corners of the sports industry to speak to UCLA students enrolled in the Sports Business program hosted by the Anderson School of Management Center for Media, Entertainment & Sports. His confident and comical personality allowed for students to ask the Vice President of Talent Marketing from the highly respected Wasserman group anything. Yeschin was able to entertain the room of college students who are hopeful to gain experience in the sports business world with his motivating tales of putting in grueling hours of sales work early in his career with the LA Avengers to his hilariously candid tales about some of our favorite sports superstars including the likes of Anthony Davis, Russell Westbrook, Landon Donovan and Red Bull. His laid-back approach and storytelling ability kept students asking questions far past the allotted time. It is safe to say that while this is not Yeschin’s first time speaking with MEMES program. Students were able to learn imperative networking skills from the distinguished sports businessman. 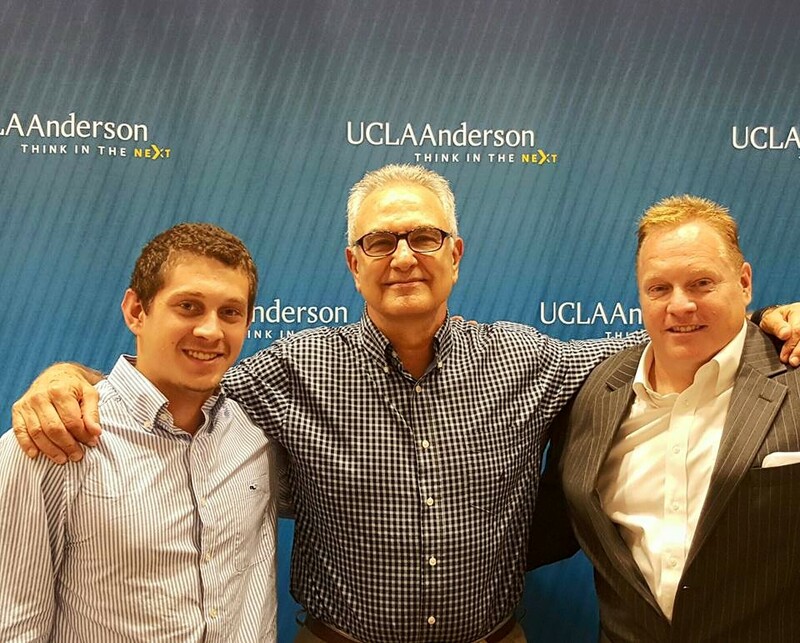 Yeschin and Wasserman have a long and storied connection to UCLA and we are always appreciative of their contributions to our Sports Business program. David Wohl, the General Manager of the Los Angeles Clippers, came to our Sports Business Program this week to give us some insight into his career and the player operations side of professional basketball. Wohl knows basketball inside and out. He spent some time playing in the National Basketball Association in the 70s. Although he enjoyed his time on what he referred to as the “See America Free Tour,” after seven years Wohl decided to take his talents to coaching, where he spent several seasons working alongside Doc Rivers. After going through the good times of winning as a coach and the bad times of losing as a player, Wohl decided to take his career to the executive level. David Wohl is currently going into his second season as General Manager of the Los Angeles Clippers. In his time with the Clippers, he worked under the tumultuous Donald Sterling regime and transitioned into the new Steve Ballmer ownership. In other words, he has seen a lot in his short time there. While Sterling never asked or valued, really, the opinions of any Clippers employees, Ballmer encouraged employees to contribute and make and impact on the team together. Between the change in ownership and his reunion with Doc, Wohl saw a bright future ahead for the Clippers. Wohl said the new Clippers team has its foundations in shared leadership. Doc Rivers insists that the players to be invested in the team and demands that they make it their team. He challenges players to talk to each other and work things out. For example, Big Baby, Glen Davis was always complaining about have to do more workouts and the other players would tell him to do more, to do better. Policing each other holds each player accountable and keeps them invested in the greater good of the team, all egos aside. This shared leadership goes beyond the court, too. Wohl said he looks to different groups among the Clippers employees to take on new tasks and jump in together on projects for the greater good of the team. When asked his opinion on analytics when it comes to choosing players, Wohl said that other qualities take priority over basketball analytics. Whether a player is coach-able, a good teammate, has good character, etc. is most important. The statistics come secondary. It’s all about the chemistry. Wohl also shed light on the importance of mentorship. The Clippers acquired Paul Pierce, so they will now have a hall of fame mentor at the three position. Wohl thinks it will be great to have another strong leader and mentor next to Chris Paul for the team to look up to. By the end of his talk, Wohl addressed what he knew we were all wondering about: the Deandre Jordan trade. In short, he told us that it came down to showing Deandre the great situation he was in and the relationships he had made in Los Angeles. Deandre is a very important part of the Clippers and everyone is happy he is staying, including Deandre. Wohl left us with some solid professional advice about breaking into the field: do something to get yourself noticed. The business is built on what is coming next; don’t show the employer what they have now, show them what the need. 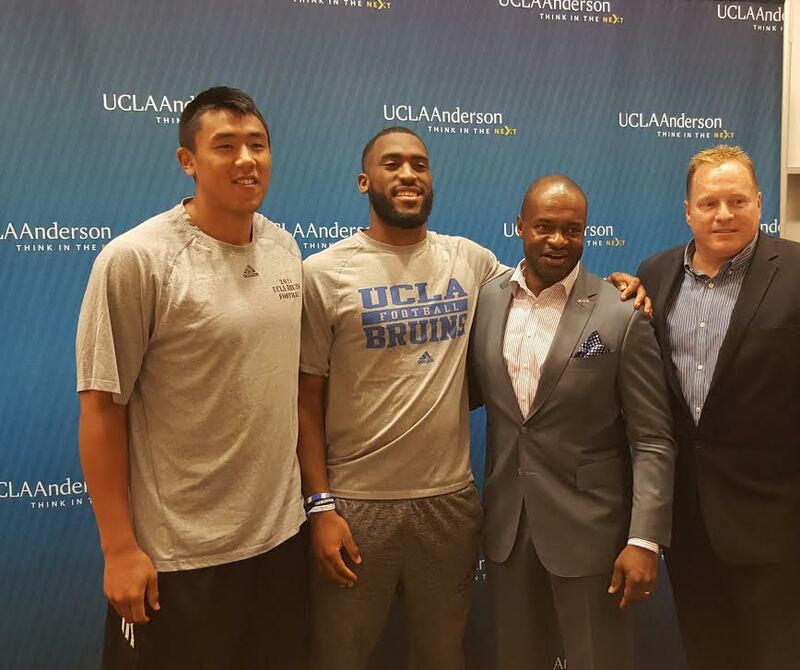 Note: Article submitted by UCLA Sports Business student, Kinsey Burgess. career with the NFLPA. He emphasized that although he hadn’t had experience specifically in the sports industry, his reputation as a non-negotiator and strong fighter in private practice allowed him to easily transition into this position, fighting for the well-being of NFL players and their families. He spoke of the breadth of knowledge that Marvin Miller (Executive Director of the MLB Players Association ’66-’82) provided him as a mentor, and stressed the importance of mentors in our own young careers. Additionally, Mr. Smith described his negotiations with the NFL and team owners throughout the 2011 lockout, during which he successfully fought for player safety (specifically regarding concussion safety), better healthcare, and increased salaries and benefits. After speaking about his own experiences, Mr. Smith was extremely generous with his time, staying to answer as many questions as the MEMES students could think of regarding ethical issues, team name controversies, the NFL Combine, genetic testing and more. He focused on the need for new, young minds with the guts to think about things differently in the sports industry in order to close the massive gap between players and management. Overall, Mr. Smith provided some eye-opening perspective regarding professional sports from the point of view of the players. The UCLA Center for MEMES cannot thank him enough for his time and commitment to the next generation of sports professionals. 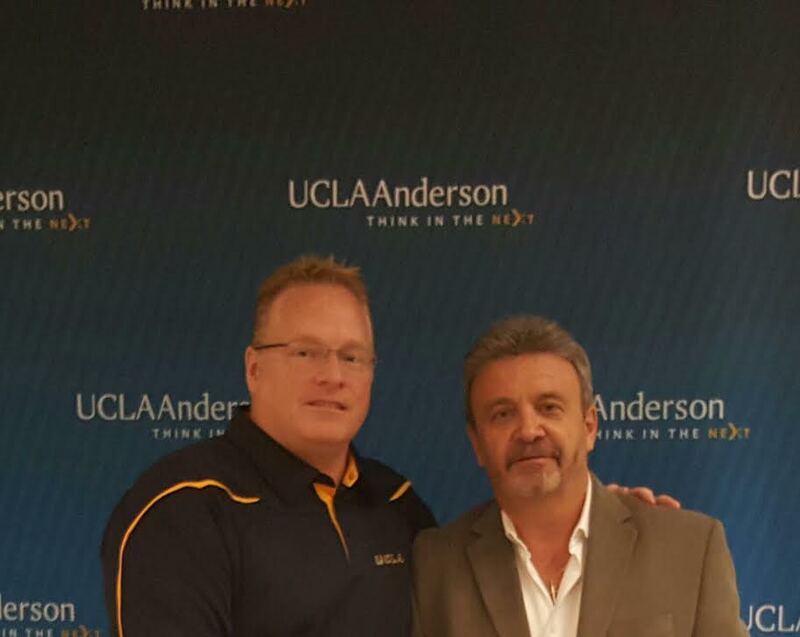 Today, our UCLA Sports Business class had the pleasure of listening to a speech from Ned Colletti, the former General Manager and current Senior Adviser to th e President of the Los Angeles Dodgers. Mr. Colletti took us through the history of his career and personal life from his time as a youth in his native Chicago through to his current position with the Dodgers. He allowed us to grill him with questions and provided us with invaluable advice and life experience that we will not soon forget. Mr. Colletti began by taking us through the early stages of his life. He took us through his childhood and we were able to see where he came from and how he was raised. He then moved on to his college years and the early stages of his working career. This is where most of us in MEMES are at in life, so it was extremely relevant to hear his mindset at our age. It was also fascinating to compare where he was at in his career to where we are at in our careers at the same stage in our lives. Mr. Colletti progressed through the latter stages of his career and made an effort to explain why he made the career moves that he did. I found this particularly helpful because hearing his reasoning will aid me in making future career moves. Hearing someone as credible and respected as Ned Colletti dish out advice was an incredible experience for all of us here at MEMES. Mr. Colletti gave us a tremendous amount of insight on how to be successful in this industry and provided us with answers on all the questions we had regarding the past, present, and future of the Los Angeles Dodgers and Major League Baseball. The most valuable piece of advice I took away from Mr. Colletti’s speech was that hard work is critical for success. He didn’t attend a top rated school or have an endless amount of connections. He simply worked hard and that is exactly what all of us here at MEMES plan on doing. I would like to personally thank Mr. Colletti for taking the time out of his extremely busy schedule to meet with our class. It truly was a wonderful experience. It was a great pleasure to see Leigh Steinberg in class again this year. Leigh not only explained his outstanding career paths, but also he gave us many constructive suggestions according to his past experience. Leigh Steinberg is arguably the world’s best known sports agent and has represented over 150 professional athletes in different sports fields, including football, baseball, basketball, boxing, and other Olympic sports. As we all know, agent is a very significant part that connects the professional sports to the economic profits. During the speech, most of the topics surrounded the “agent”, such as how to deal with the relations between players and agent, how to recruit potential players, and how to guide players to act positively in front of public. Those topics are quite interesting and fresh to all the students, especially to those rising future agents in the class. As usual, he also provided many useful suggestions on how to find and get an ideal job or internship. He emphasized the uniqueness. A dry resume cannot make the candidate outstanding from thousands of other applicants. Applicant needs to have something innovative to attract the recruiter. It was very educational speech everyone enjoyed the two hours with him. MEMES really appreciates Leigh Steinberg’s dedication to the UCLA Sports Business program at the Center for MEMES..